Jack Frost will surely nip at the nose of anyone brave enough to stay outside the Oulu University Hospital in northern Finland on this freezing cold winter morning. It is -4F˚ (-21C˚), but that is nothing unusual here, only 100 miles south of the Arctic Circle. Something much more interesting is standing in front of the hospital: a brand-new, shiny trailer with “Mobile MRI” printed on the side in big letters. Inside it is cozy and warm, the lights are bright, and a lively discussion is in full swing. Tuija Mäkelä, MR applications specialist at GE Healthcare, is busy training the personnel of this newly acquired mobile MRI trailer. 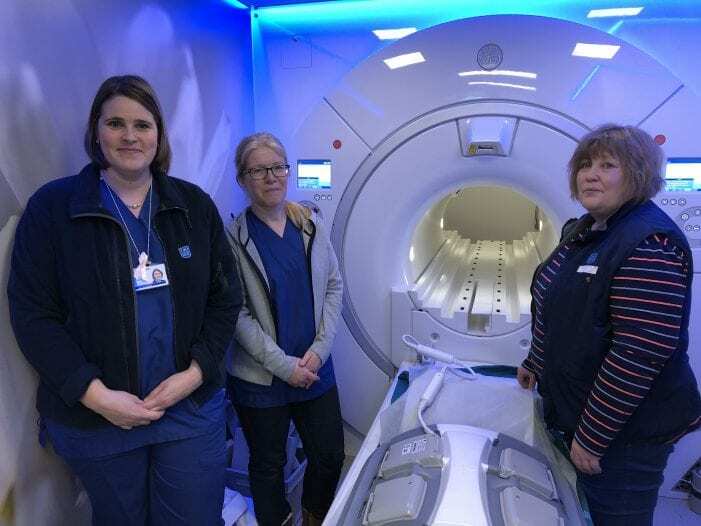 Teija Vikki and Jaana Jutila of Oulaskangas hospital are learning how to use the equipment system and to perform MRI studies on test patients. Bordering the Baltic Sea, Gulf of Bothnia, and Gulf of Finland, as well as Sweden, Norway, and Russia, Finland is the northernmost country of the European Union. The Finnish healthcare system is often considered one of the best in the world. In the Global Burden of Disease study, published by medical journal The Lancet in 2018, hundreds of researchers from around the world closely examined and compared topics like disease statistics, mortality rates, risk factors, and health issues in 188 countries. The quality and equality of health care services in Finland were rated among the best in the world. However, the northern parts of the country are sparsely populated, and cities are far apart, which can make access to specialist healthcare challenging. Oulu University hospital serves an area that accounts for over half of Finland and is home to more than 740,000 people. To be able to guarantee high-quality diagnostic imaging for patients living in remote regions and outside of large cities, the northernmost university hospital in the European Union needed to think outside of the box. Or, in fact, outside of the hospital: the solution the hospital came up with is ‘MRI on wheels’, a truck equipped with an MRI machine. “We wanted to serve our customers near their homes,” says Professor Jaakko Niinimäki, Chief Radiologist at the Oulu University Hospital. “With the mobile MRI, patients of the university hospital can be examined with appropriate equipment while avoiding unnecessary travel”, Professor Niinimäki points out. The new mobile MRI is the second one the hospital has acquired – the first one has served patients for 11 years already. The concept works so well that the hospital wanted another one. The new mobile MRI serves patients mainly in the small towns of Oulaskangas and Raahe, within about one hundred miles radius of Oulu. 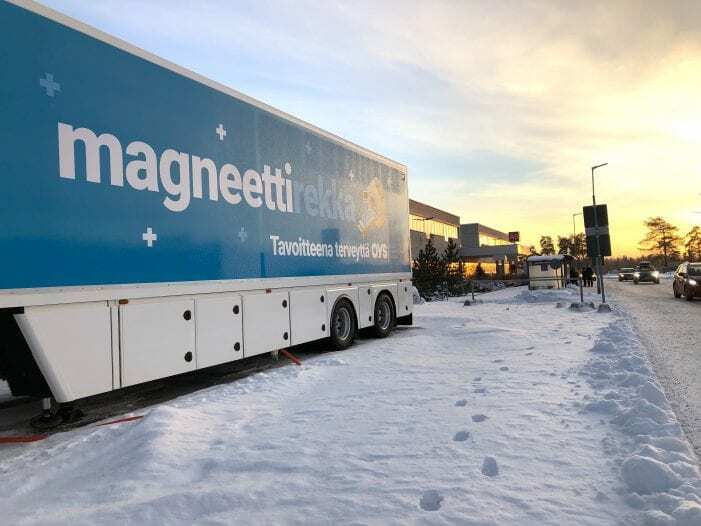 The name of the MRI truck, Terhi, was coined by service leader Jyrki Tarkiainen who works in the hospital technology department. He hoped that the Mobile MRI, a.k.a Terhi, would be just as devoted to its patients as the role model for the project, Terhi Nevala. Nevala is a senior physician and radiologist who had an active role in the mobile MRI project. The Nordic weather conditions are a challenge the mobile MRI has to manage. The system needs to function flawlessly on extremely cold days, despite heavy snowfall, or during heatwaves like the one which swept across Northern Europe in the summer of 2018. The truck itself is manufactured in the Netherlands by Mobile Medical Imaging expert Lamboo Mobile Medical. This unit is equipped with a special “Lapland” package. The walls, floors, and doors are all heated and the mobile unit as well as the MRI system itself are very well insulated, and there are several options to choose from based on the outside temperature. 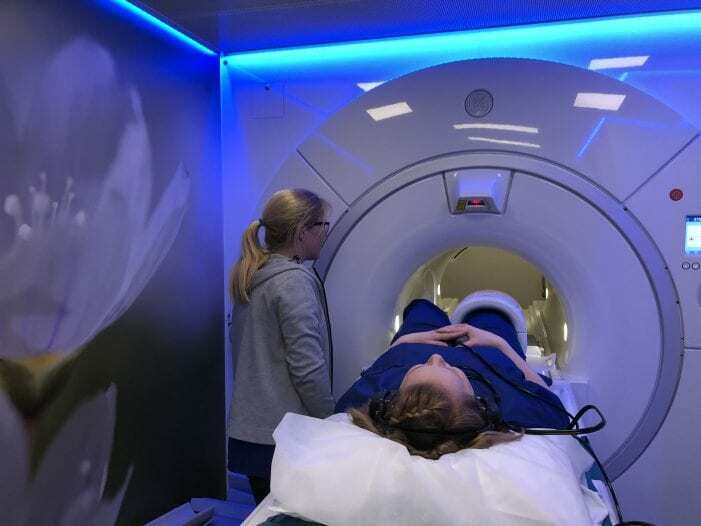 ”There are certain challenges and aspects to consider when a sensitive MRI system is installed into a mobile unit,” says Roope Salonen, MR Field Engineer at GE Healthcare. The system is constantly on the road and susceptible to fluttering and shaking. “Changes in temperature and weather conditions also need to be considered during installation, scanning, and system maintenance,” Salonen points out. Besides the technical requirements, a lot of attention has been paid to the patient experience. One of the main factors impacting the patient experience is the MR system itself: SIGNA Voyager 1.5T. This system is designed to maximize productivity and workflow while delivering clinical potential and patient comfort. The 70cm wide bore feels spacious, and even though MR scanning makes some noise, the SilentScan technology reduces it without compromising image quality. For the scan, the patient is handed headphones and encouraged to listen to their favorite songs while the machine does its work.